Within three hours of setting foot on Australian soil, I’m 434 feet in the air high above Sydney Harbor, brushing back wind-blown hair and soaking up sunshine. I’m looking down at boats churning through the water from the top of the internationally famous Harbor Bridge—with the iconic Sydney Opera House just in front of me. It’s almost unbelievable. But it’s real, and I’m enjoying every minute of the adventure. Our guide, Maria, asks Larry and me to stop and pose for pictures. 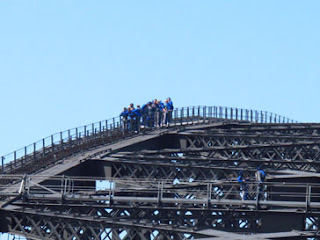 First, we take shots about halfway up the bridge, then more at the top with the Opera House in the background. It’s good that she’s doing this because we’re not allowed to take cameras—or anything else. In fact, we’ve been quizzed about medical conditions, taken a breathalyzer test, signed release forms, emptied our pockets, and slipped on provided blue and gray jumpsuits. We’ve been outfitted with carabineers to attach to the cable on the bridge and radios to hear Maria’s commentary and instructions as we climb. And we even tackled a practice climb with stairs and ladders before heading out through a tunnel for the real thing. 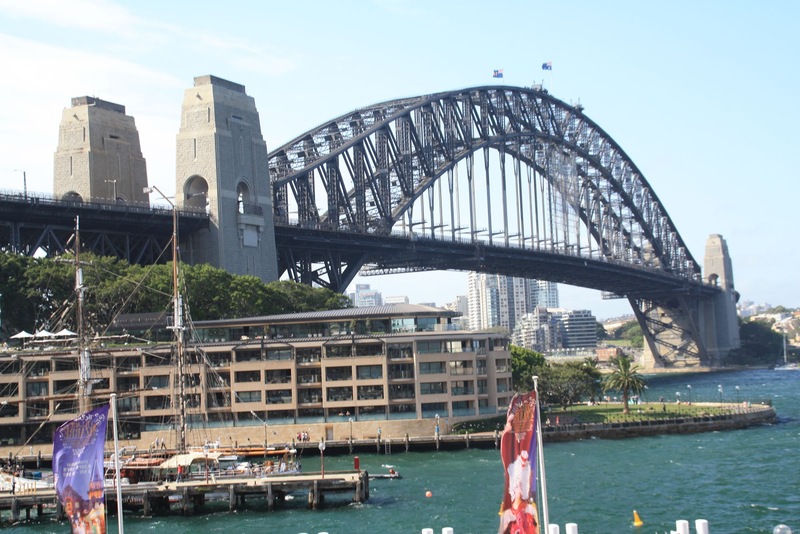 We hear noise from cars cruising on the six-lane highway below—a major bit of engineering foresight because when the bridge was started in 1924, there were only five cars in Sydney. Now it’s a busy thoroughfare, and we have a bird’s-eye view between metal rafters and beams. 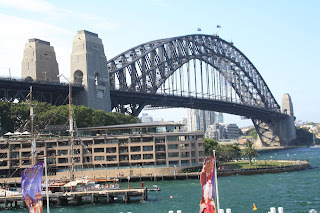 As the longest single span arch bridge in the world, Sydney Harbor Bridge was officially opened on March 19, 1932 and remains a centerpiece of the city’s transportation network. We're at the top overlooking Sydney Harbor with the Opera House behind us. Nicknamed the "Coathanger” because of its arch-based design, the bridge totally changed the character of the city. It kept people working and the economy of the city strong through a depression that hit during its eight years of construction. Residents are rightfully proud of the precision that went into building the bridge. For example, 4,000 huge granite blocks each took two weeks to cut to specifications, but when assembled into walls under the bridge not one had to be recut. The bridge rises, then crosses over and returns on the other side. The climb isn’t too difficult or dangerous since each participant is tethered to a cable the entire time. However, people who fear heights or strong winds might be uncomfortable, especially at the top. Still, the effort is worth every stunning view of sailboats and ferries in the harbor, the city center and skyline, and the beautiful sail-shaped Opera House. Following our tour, we devour a pizza at a nearby pub and then walk back to explore one of four concrete and granite pylons that flank the bridge. We learn more history while climbing up inside the pylon to an outdoor viewing spot, a great place to take the photos we couldn’t get during the bridge climb. The three and a half hour tour is well organized, and guides are very knowledgeable about bridge statistics and history. Tours leave frequently during the day, and twilight and night tours are also available. 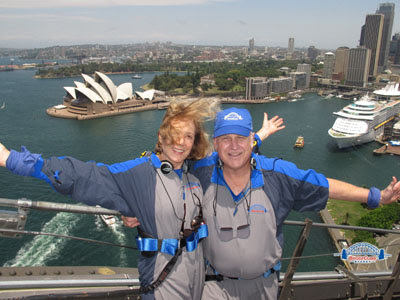 Contact www.bridgeclimb.com for more information and rates. 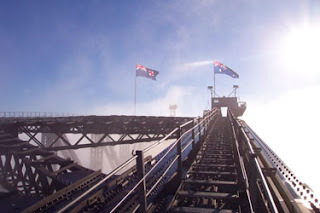 Photos by Larry and Beverly Burmeier and BridgeClimb.